"The Confidential Dog Food Report: The 9 Very Best, Ultra-Healthy Dog Food Brands in all of North America"
"The 9 dog food brands listed are now better than ever for your dog! We thoroughly re-researched every brand on our 1st Edition list and kicked out 5 of them!" A report about the increasingly popular vitamin additive 'Menadione', and our opinion of it. A list of the brands that were kicked off of our list and the reason why. A list of the brands considered for our list but failed and the reason why. A COMPLETE list of ingredients for each of the 9 dog food brands we recommend and feed to our own dogs. Report That Until Now Only I Have Seen! "All you have to do is order the Gold Package today!" "No Dog Should Eat Commercial Dog Food Not Nutritionally Abundant, Perfectly Balanced & Free of Dangerous & Unnecessary Ingredients"
Unfortunately, that means 99% of all commercial dog foods are not suitable. But what do you do when you don't have the time or energy to prepare food for you dog? 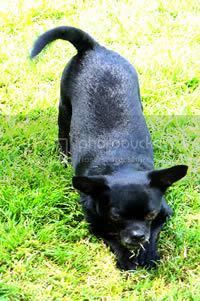 In these situations you must have a source of dog food in your house which is ultra-healthy and easy to serve. I gave her a list of very strict criteria and told her not to include anything unless it met every high standard I set. The reasons why each dog food brand included was good enough to feed to my dog because I couldn't just take her word it, I needed proof and now you can see for yourself why each food in this report is fantastic, ultra-primo stuff... creme of the crop! The website of the company that makes the food, so I could verify myself what's in it, how it's made and if it's good ebough for my dog to eat... and now you can too. Where I can buy it from because there's not much point if it's only available from a local deli in Northern Alaska. Now you can take a quick glance at this report and then head straight to that store in your own location.. saves you hours of time searching through the phone book or driving around frustrated. Any potential problems or down-sides that I should know about because I've researched the dog food industry long enough to know they have a lot of tricks up their sleeve to confuse you. Now, for the first time ever, someone is telling you the good and the bad so you can make a truly informed decision. The final requirement I had was a photograph of the product because I don't want to walk around the store for 45 minutes reading every dog food label until I find the one I'm looking for... now you won't have to either. This researcher went into-the-field to complete her mission and came back 8-days later to say she failed! She said, using my very strict criteria and high standards, she could only find 9 companies in all of North America that made food good enough to be on the list! The state of the commerical dog food is worse than I thought. But with this special report, you no longer have to worry because the quality of the foods it profiles are incredible. 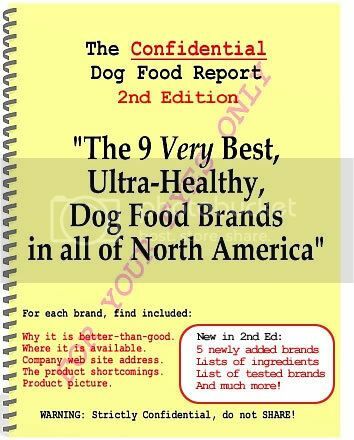 'The Confidential Dog Food Report: The 9 Very Best, Ultra-Healthy Dog Food Brands in all of North America', cost me $150.00 $500.00 $500.00 (another $350.00 for the Edition 2 release) to have researched and created and it has been my special weapon for the past 6-months. I've tried every brand on the list and they are truly fantastic, the best-of-the-best. Ginger, my dog, loves them, and I can feed them to her with no guilt OR concerns about her health.. it was well worth the investment. I've decided to share 'The Confidential Dog Food Report' with you for a fraction of the $150.00 $500.00 $500.00 (another $350.00 for the Edition 2 release) I paid, the cost to you is only $10 when you include it with your copy of Dog Food SECRETS™ by ordering the Gold package! "But now that I bought some of the dog food you recommended by the Confidential Dog Food Report and made some homemade stew from one of the recipes, he just loves it!" eating all of his meal AND enjoying it. I haven't had this great dog food information for too long yet, but I have had some positive results already. My mini dachshund Ajax doesn't have any health problems, but he often wasn't too excited about his food. Many times he wouldn't even eat right when I put it down; he'd wait until later. But now that I bought some of the dog food you recommended by the report and made some homemade stew from one of the recipes, he just loves it! He eats it all up right away. It's great to see him enjoying his food again. "Since changing her diet she is playing longer with shorter breaks. I have also noticed she is doing less scratching and is more active again. "Looking forward to the long term effects on her!" Montana Is my 3 yr old chi she has been eating commercial food and seemed to be doing ok except for the fact she was putting on weight. After reading your books I decided to try her on one of the foods you recommended. It has been about a month now and she has lost about 1/4 of a pound. I know that doesn't sound like much but in a chi it is a lot :). I have also noticed she is doing less scratching and is more active again. I attibuted her inactivity to her weight gain. She would tire easy and take longer breaks when playing ball then she use to. Since changing her diet she is playing longer with shorter breaks. Looking forward to the long term effects on her. "I doubt that I am a candidate for home cooking so the information contained in the Confidential Dog Food Report is invaluable to me." Currently there are no photos of Toby and me. I thought you might get a kick out of this photo of Toby at 10 months (not posed). Toby seems to be thriving on a popular dog food brand, but after reading your book and the Confidential Dog Food Report, at least one of the ingredients, Animal Digest, concerns me enough to do some further research. I doubt that I am a candidate for home cooking so the information contained the Confidential Dog Food Report is invaluable to me. Obviously, it is unfortunate that the dog food industry is able to get away with using inferior and/or toxic ingredients in their products. 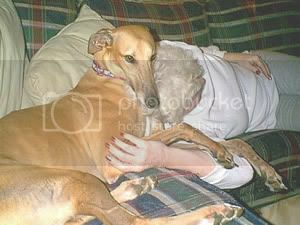 "Our dog Desire has not had a seizure since we started this dog food..
To my amazement, the one we are using is in The Confidential Dog Food Report [that comes with the Gold Package]"
One of my dogs is a Greyhound named Desire, which I have had almost two years. Shortly after we got her she started having seizures. The specialty vet, for a year and a half, was trying to control her seizures with medicine, it was working somewhat but never did get rid of them completely, still having at least 2 a month. A lady on the internet that we where talking to through a Yahoo Greyhound group suggested we try a special dog food. She said it was/did help her dog stop having seizures. So we tried it and our dog Desire has not had a seizure since we started this dog food.. This was long before we came upon your site about dog food and its ingredients. 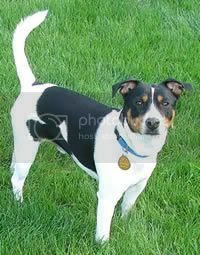 To make a very long story short we got the DOG Food SECRETS books and the Confidential Dog Food Report which has the list of the 9 best dog dog foods which are the best and healthiest dog food for your dog. To my amazement the one we are using is on that list! So at this point you can see why I was so amazed and do believe in GOOD DOG FOOD. 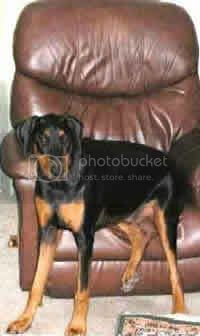 "I was happy to learn that the brand of dog food I've been buying is on the 9 best available. "Even though it is not perfect I am confident that Frisco is getting high quality nutrition that is safe for him." Frisco is a Danish-Swedish Farmdog, of which currently there are only 75 in the United States. Those of us lucky enough to own one of these great dogs want only the best for their health. I have been very interested in the ingredients that dog food companies put in their dog food for a long time. I am very much concerned that Frisco get only the best dog food available. It is important that he does not eat any of the bad things such as "meat by products" and some of the things used as preservative. I was happy to learn that the brand of dog food I've been buying is on the 9 best available. Even though it is not perfect I am confident that Frisco is getting high quality nutrition that is safe for him. I will also add to his diet some of the "home made" treats ect that I now have the recipies for. You can see from the above success stories, this report changes lives. 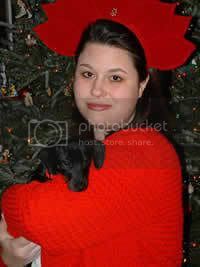 And this is your only opportunity because..
Other dog-owners have offered me $50.00 plus, to get their hands on this confidential report because it's one of a kind and extremely valuable. But when you get your copy of Dog Food SECRETS™, you can now get a copy of this report for only $10 by ordering The Gold Package (you don't pay $10 extra, just get the Gold Package which is $10 more than the Silver Package). Click the link below to make secure order of The Gold Package now.